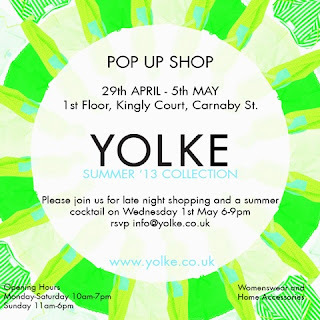 Yolke, who held a pop-up shop off Oxford Street in March for one day are back for a longer stint at Kingly Court, off Carnaby Street, to coincide with a Carnaby shoping event with Grazia on 2nd May. 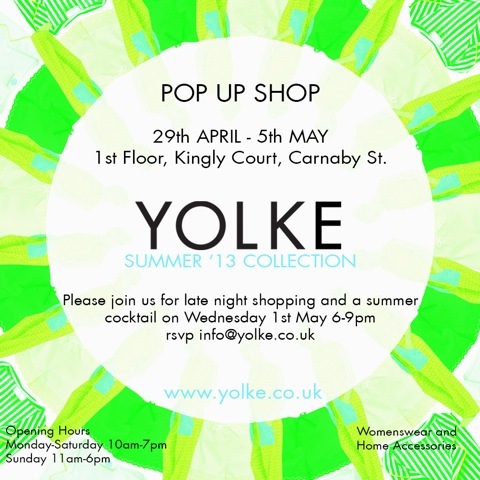 There's also a late night event on 1st May - see pic above for RSVP information. "Presented in complimenting colours and fabrics YOLKE blurs the boundaries between fashion and home, placing a fresh and playful take on once traditional practices of silk and wool weaving. Super soft lambswool blankets and silk cushions in contemporary designs will on sale during the day alongside the Summer clothing collection."